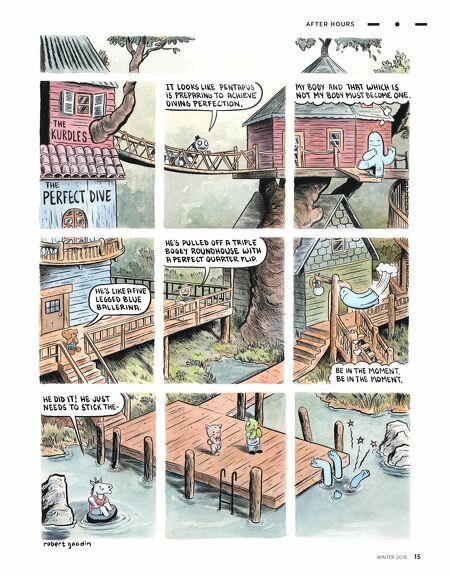 A F T E R H O U R S A FAN OF INDEPENDENT COMICS, ROBERT GOODIN INFUSES THE PAGE WITH PERSONAL EXPERIENCE. By day, Goodin is a revisionist at American Dad. By night and weekend (and any other free time), he's an indie comic aficionado who released his first graphic novel, The Kurdles, in 2015. It's the story of a teddy bear named Sally, who gets separated from her owner and discovers a new home in Kurdleton, a forest filled with quirky characters, including a color-changing Pentapus. "It's just nice to try to tell a good, honest story to a younger audience that has no other tie- in to corporate interests like toys or rides or all this other stuff—to just try to create some good, solid characters where the story works on an enjoyable, superficial level," he says, "but also there [are] things happening under the surface that kids can either pick up on, or they can not pick up on—it's fine either way." Goodin and his wife fostered three children for a year and a half, and he channeled some of his anxieties about parenting into the book. While they still see the kids regularly, the children are a bit too young for The Kurdles right now. However, they might be ready for the next iteration: Instead of a traditional graphic novel follow-up, Goodin plans to release a magazine this summer. Called The Kurdles Adventure Magazine, it'll contain a serialized second book that he hopes will help shape young readers and make them think about things in a different way. "There's definitely some aspects in that about how a kid might adjust to completely new surroundings, how do they take in unspoken rules within either a family or a school, how do you fit in to that environment," he says. "I moved around a lot as a kid, so I was hyper-aware of those things when I was growing up." As a kid, Goodin loved comics—but he found himself drawn to the more personal nature of indies rather than serialized superheroes. "In the ones that I tend to enjoy, it's that person's handwriting that you're reading; it's their ink line, their color sets. It's really them on the page. All those things are very personal and unique to that artist," he says. Some of his favorites include Robert Crumb, Charles Burns, David Mazzucchelli, David B., and Jacques Tardi, and he posts his own work along with gems from his personal collection of those artists and others on instagram (@nidoog). While Goodin has worked as a storyboard artist for 20 years now, there's something about creating his own comics that has fulfilled him creatively more than any existing superhero ever could have. "With the kind of comics that I'm doing, outside of the mainstream superhero world, I've always had complete control over every aspect of it—from writing it, to drawing it, inking it. If they're color, I color it. I've often been the one to publish it and design the book." On American Dad, he's a smaller piece of a larger machine. But when he creates his own comics, he's the boss: "There's no interference whatsoever," he says. "So whether it succeeds or it fails, it's completely on me." 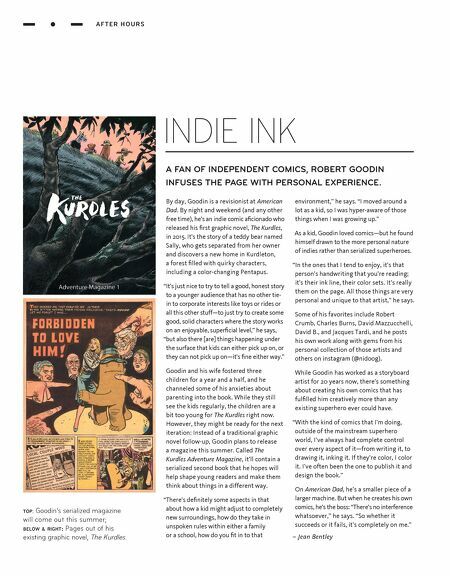 – Jean Bentley INDIE INK top: Goodin's serialized magazine will come out this summer; below & right: Pages out of his existing graphic novel, The Kurdles.